A lot of us bet on things we are sure of. Sometimes the bets are friendly, while on other occasions the bets involve money. But what if one could significantly increase their chances of winning a bet based on data and logic? Well, I think that would be simply wonderful!! And that’s where the concept of prediction markets comes into the picture. Let’s see how prediction markets and blockchain can work together to make a better world and how they can help in Googling the future. Prediction markets (also known as predictive markets, information markets, decision markets, idea futures, event derivatives, or virtual markets) are exchange-traded markets created for the purpose of trading the outcome of future events. 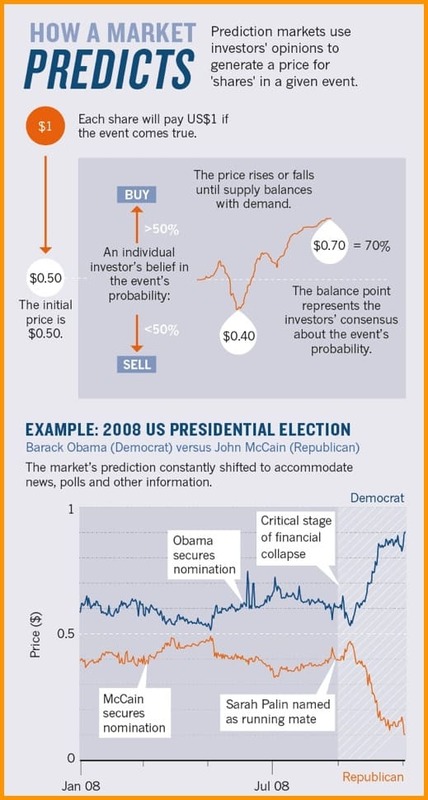 The prices in this market can be indicative of the probability of an event based on the crowd sentiments. And these probabilistic contracts are binary in nature, meaning either your trade will have 0 value or it will have 100% value because when betting, there are only two probabilities i.e. either it will occur or not occur. And the whole concept of prediction markets is based on a principle called Wisdom Of The Crowd, which state that if you ask enough people, their average answer is usually far more accurate than any expert. Based on this, one can make a powerful forecasting tool that can help you place better bets and help in further decision making. But like I said earlier, these markets are basically trading so you need to put your money in the system to vote and buy your bets. Why pay before the outcome of the actual event, you may ask. The reason you will put money is that there is an incentive to earn more on the money you will put in if the actual event’s result goes in your favor. But if you lose, everything goes. See below an example where you can buy a right to vote on the prediction of the presidential election. In this case, you buy it for $0.50 and now vote that ‘Barack Obama’ would win. After the actual election results, you will get extra $0.50 on each of your $0.50 because the actual result is in your favor. In the past, companies like Google and HP have used in-house prediction markets to arrive at conclusive decisions regarding the launch of a product or setting up of a new facility as this also helps in prioritizing the things by harnessing the crowd wisdom. You can do this virtually with everything or every event in a prediction market. For example, what will be the price of oil after a week, who will win the Oscar this year, who will win the Football World Cup this year, or will Elon Musk succeed in colonizing Mars, etc. …is this kind of prediction market is pure betting and can be highly manipulated due to some insider information that can rip off a large number of investors in one shot. Plus, these prediction markets are centralized in nature and often face financial irregularities and regulatory pressure from the governments. That’s why they are not easy to operate and this has proved true in the past also when Intrade was shut down. Intrade.com was a web-based trading exchange whose members “traded” contracts between each other on the probabilities of various events occurring. After having been forced to exclude US traders in 2012, on 10 March 2013 Intrade suspended all trading, citing possible “financial irregularities”. As you can see in the example of Intrade, it was solely due to centralization that this prediction market failed and ceased to operate. But when you combine the power of decentralized blockchains with prediction markets, we will get unstoppable DApps for the prediction markets. We will discuss these blockchain-based prediction markets in our next article. Until then, stay tuned to CoinSutra and keep learning about the blockchain revolution.